Sometimes I wish there was a simple button that would turn the planet into a plastic free, fossil fuel free paradise with delicious vegan food and fair and sustainable clothes accessible for every human being on Earth. As there is no such thing, we don’t have a choice but to make the changes happen ourselves. Change takes time. Motivation. Dedication. It can be painful and uncomfortable. It can be frustrating, especially when you feel that things go too slow, or do not make a difference. Those moments you look at your garbage bin and it is full of plastic yet again, eventhough you go to the market every week with your reusable bags. When you do a footprint calculation and you are still not within the boundaries of the planet. When you read that yet another 10 species went extinct in the last month. I found out that making a list of all the things I already did and the things I still want to do to lower my footprint helps me at those challenging moments, where I just want to sit in a corner and cry because I feel it doesn’t make any difference what I am doing. I use the list to reflect, to look back at what I already achieved and at the same time to look forward to what I still can do. And what better moment to make such a list than in January, the moment for New Year’s resolutions! What did I do in 2018 to lower my impact on the planet? Let’s start by looking back. It’s so easy to forget the things you already did. We have the tendency to focus most of our attention on the things we still have to do. And eventhough looking forward is important, a moment of reflection every now and then is just as valuable. 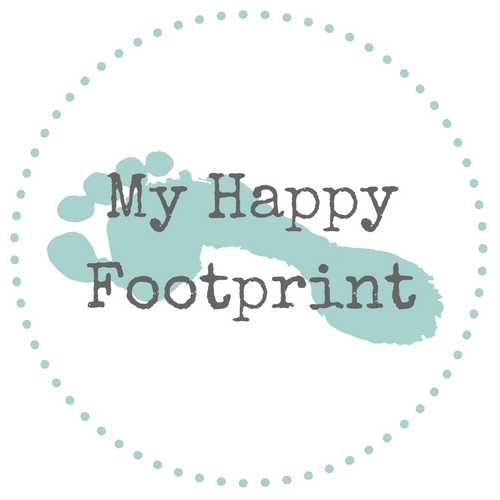 Here are 20 of the things I did in 2018 to reduce my footprint. 16. Replace disposable cups with a reusable bottle for water, coffee or tea. 20. Read the book “The Hidden Impact” of Babette Porcelijn to learn about the impact of our lifestyle choices. This list makes me happy. I am not there yet. Not even close. But I am making progress. And seeing this list gives me an incredible amount of positive energy to keep lowering my footprint. I composed a list of 20 things I would like to do this year to keep lowering my footprint. Some acts are smaller than other ones. Replacing my old plastic toothbrush with a bamboo one will not require the same effort as completing the 30-day vegan challenge (which I took in 2018 as well by the way, but I messed up on the first day already) I like that balance. If all actions would be enormous, I think I would feel overwhelmed. As you can see, I compiled a list that includes quite a lot of actions to prevent food waste (such as the cooking techniques from the awesome team of Instock or through the Too Good to Go app). It’s an area I really would like to focus on this year. Why? According to the United Nation Food and Agriculture Organization (FAO), global food waste represents more greenhouse gas emissions than any country in the world except for China and the United States. With so much food being wasted (it is estimated that roughly one-third of the food produced for human consumption worldwide goes to waste) and the big amount of plastic packaging used in the food industry, this is a part where I think my individual actions can have a big impact. I really hope that the actions on this list can contribute to pushing Earth Overshoot Day back, even if it is just a couple of days this year. 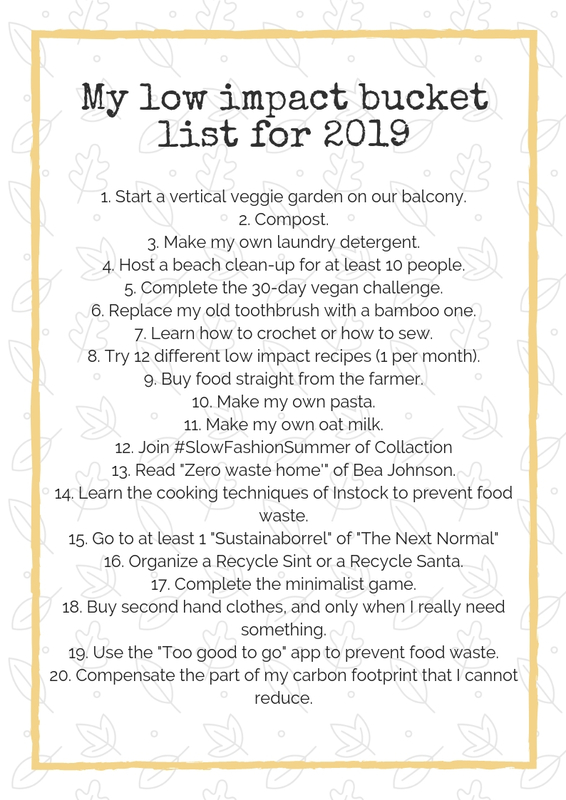 Feel free to use items from my 2018 and 2019 list to create your own low impact bucket list. And if you have one already, don’t hesitate to share it. I would love to be inspired by your actions. Let’s turn 2019 into a green year together!